U.S. 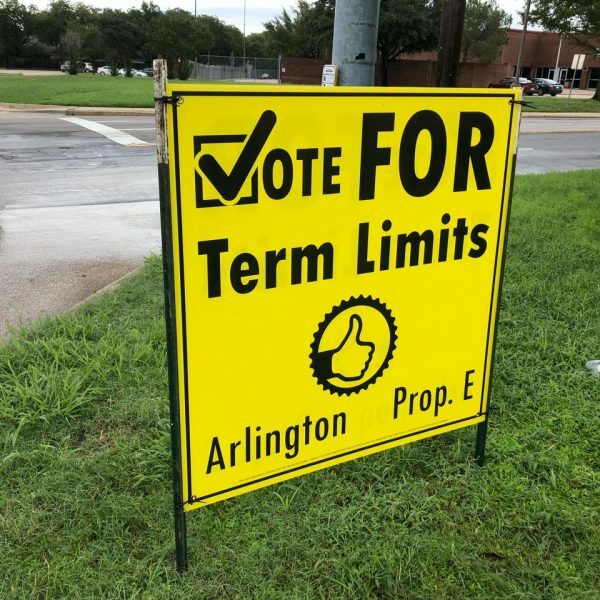 Term Limits enthusiastically endorses Proposition E to implement a six-year term limit on the Arlington City Council and Mayor. This term limit would be the strongest in Texas and one of the strongest in America. It would curb corruption and maintain accountability, while ensuring fresh faces and ideas have a prominent role in city leadership. Throughout this campaign, City Council members and Mayor Williams have used every trick in the book to protect their power, hinder term limits and prevent citizens from voting on this issue. By continuing to fight their own citizens in court, this Council has proved it has zero regard for the democratic process upon which public service is based. We believe the Council’s actions epitomize the arrogant and destructive behavior that develops when politicians stay in office beyond their past-due date. If anything, this has only underscored the critical need for term limits. Municipal offices throughout America have benefited greatly from term limits. Nine of the 10 largest cities in America have term limits, which have successfully shattered incumbents’ monopolies and delivered more competitive elections. There is no reason why Arlington — a vibrant and growing city — should not realize these same benefits should term limits pass.